High quality analogue and digital electronics development. Offering turn-key systems for research and production. High performance UT pipeinspection for OCTG inspection plants. On-site training and support. Remote support possible by Ethernet. 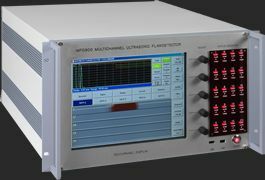 The MFD900 ultrasonic hardware offers a high speed test facility in parallel or multiplex mode. The MFD900 ultrasonic system allows direct hardware connection of start/stop switches, encoders, valves ,horn etc. The MFD900 software offers a total solution from testing to final test report , ALL IN ONE.